Sandeep has received numerous awards, a selection of which are listed below. Indian Board of Alternative Medicines, India. Universidad Nacional de Ingenieria, Lima, Peru. Universidad Nacional Agraria, La Molena, Peru. Universidad Nacional Mayor de San Marcos, Lima, Peru. Fundacion Universitaria San Martin Y Bienestar Universitario Baranquilla, Colombia. El Bosque Universidad, Bogota, Colombia. International Theatre Olympiad 2009, Cuttack, NIPA – New Delhi, AITA – Estonia and UNESCO – Denmark. 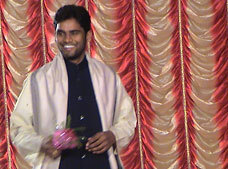 Power Star Pawan Kalyan Association, 2008 Nizamabad, India. Indur Shatabdi Utsav 2007, organised by Nizamabad District Adminsitration, Government of Andhra Pradesh, Nizamabad. As a gesture of our gratitude for your noteworthy contribution for the development of Drama, Dance and Music as well as Art and Culture presented by International Children’s/Youth Play & Dance Festival 2007 awarded by the Justice D. P. Mohapatra, Chairman, Human Rights Commission, Orissa, Associated with NIPA  Delhi, National Centre of AITA  Estonia, UNESCO  Denmark, Theatre Movement  Orissa. For your outstanding performance, extraordinary contribution and excellent service to the promotion, preservation and popularization of the heritage of Indian Performing Arts. Presented by Orissa Sports Minister Sri Debasis Nayak at the National Theatre Confference organised by UYSS  Cuttack, NIPA  New Delhi, AITA  Estonia and UNESCO  Denmark. International Theatre Olympiad 2004 - UNESCO  awarded by the Chief Justice of India. International Theatre Olympiad 2003, Orrissa, Associated with NIPA  Delhi, NATA  UNESCO  Denmark. 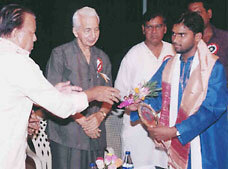 International Theatre Olympiad 2002 - UNESCO  awarded by Chief Minister of Orissa. International Theatre Festival 2002, Orrissa, Associated with AITA  UNESCO  Denmark. International Theatre Festival 2001, Orrissa, Associated with AITA  UNESCO  Denmark. Human Rights Commissioner, Orisssa. Rang Mahotsav 2004  Uttar Pradesh. 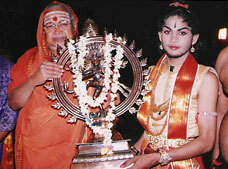 Akhila Bharatha Navarasa Competitions 2000, Chilakalooripeta. Department of Culture, 2003, Govt. of AndhraPradesh. Department of Culture 2005, Andhra Pradesh. Lalitha Devi Ashramam, 2003, Nizamabad. Utkal Yuva Sanskrutik Sangh, 2003,Cuttack. Sandeep Bodhanker receiving an accolade in Mumbai, on Indian National Day January 26, 2005. Receiving the Pushpagiri award by Sri Jagadguru Shankara Charya, Pushpagiri Peetadi Pathi. Receiving the coveted Nritya Bhushan Award by the Chief Justice of India Mr Ranghanth Mishra and the Central Sangeeta Nataka Academy Secretary and Orissa Justice Minister. 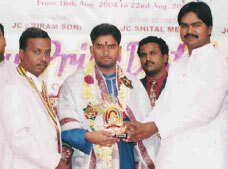 Receiving the Gem of Nizamabad by Junior Chamber of India, Nizamabad, AP 2005.